« Season’s Greetings from all at Nonlinear! One of the biggest challenges in metabolomics is compound identification – it’s a topic that comes up continually, and something at Nonlinear HQ that we’re constantly trying to help with. The recent releases of Progenesis QI have focussed on improving the process of compound identification, but do you know just how many tools are available within the software? MetaScope is a tool unique to Progenesis QI, and is the most versatile identification plugin we offer. It can be used to perform a neutral mass search but also allows searching using retention time and collisional cross section (CCS) values. For the neutral mass search, MetaScope can read libraries in either SDF, CSV, XLS or XLSX format to give flexibility in the source of your chosen libraries. The ability to search SDFs means you can make use of publicly available libraries, such as HMDB. Thanks to Progenesis SDF Studio, you can customise existing databases by merging multiple files, removing entries or fixing errors. Having the option to search from a CSV / Excel file means you can make your own library without the need to construct an SDF. MetaScope can also make use of fragmentation data by searching a fragment database or by doing theoretical fragmentation. If you’d like to build your own fragment database, Progenesis QI can help you do that too. ChemSpider is a web-based chemical structure database with access to over 32 million structures from hundreds of data sources. This tool makes use of those ChemSpider web services, automatically exporting data from Progenesis QI to ChemSpider for searching according to the parameters you select, importing the results, and assigning them against the correct compounds within the software. As well as being able to define which of the 600+ libraries to search from, and set parameters for precursor tolerance, you can also perform theoretical fragmentation on the search hits, and filter the search by elemental composition and isotope similarity score. Just as for MetaScope and the elemental composition tools, parameter sets can be saved for use with subsequent experiments. Don’t have access to your own library and don’t want to download one? 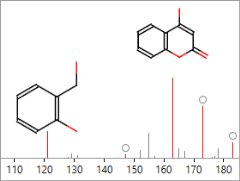 You can make use of METLIN, a metabolite database containing over 240,000 compounds. METLIN, developed by the Scripps Center for Metabolomics, provides information on names, formulae, theoretical masses, and a link to a webpage detailing identifiers for the compound on various other databases such as KEGG and HMDB. 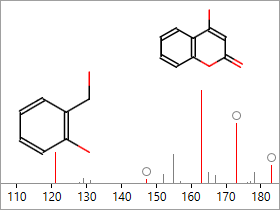 LipidBlast is a computer-generated MS/MS database produced by the Metabolomics Fiehn Lab. Since theoretical fragmentation searching can be unsuitable for lipids due to the specificity of bond breakages, LipidBlast is a useful alternative. When you can’t find a database match for your compounds, it may be useful to see the theoretical molecular formulae that match the measured masses and isotope distributions. This tool can also help you to filter down a set of potential hits retrieved from a database search. Progenesis QI has 3 pre-defined parameter sets: small molecules, lipids, and CHNO (optimised for simple organic), but you can also create your own which can be saved for future use. Once you have the theoretical formula, you can search this manually in online databases such as PubChem to return potential IDs. The NIST MS/MS library search plugin bundles the NIST 14 LC-MS/MS libraries and performs a combination of neutral mass and MS/MS based searches. This can provide a higher degree of confidence to using just theoretical fragmentation and saves time spent creating your own MSMS library. Please note that this plugin comes at an additional cost – please contact us for more information. We’re always looking for more ways we can improve the identification process, so if there’s a tool you’d like us to link up with, get in touch. Since this post was first written, there’s been an important new addition to your compound identification options: the Metabolic Profiling CCS Library. This new plugin uses the same search and scoring algorithms as Progenesis MetaScope to allow identification using its built-in Waters Metabolic Profiling CCS library. The library includes both CCS values and MS/MS fragmentation data and can be highly effective even for analyses without ion mobility data, but its greatest strength is arguably the inclusion of the collision cross section data – a physicochemical property and so independent of the acquisition platform. Having this extra dimension in your data offers a great boost to the specificity of your identifications. This entry was written by Vicki Elliff, posted on January 11, 2016 at 8:00 am, filed under January 2016 and tagged Progenesis QI. Bookmark the permalink. Follow any comments here with the RSS feed for this post. Post a comment or leave a trackback: Trackback URL.